This report presents an analysis of 100 top blogs, picked from the Technorati top 100 list. For each of these blogs, the front page (homepage) has been analyzed to see how large its download size is and what contributes the most to this size. We have chosen to not present the blogs individually in this report, but have instead focused on them as a group to get more general data. The size difference between the different blog front pages was very large. One front page was close to 6 MB in size, though it is an extreme case and should not be considered representative. Most blog front pages, 93%, were below 2 MB in size. The average total size of the front page was 934 KB. 35% had a front page larger than 1 MB. 26% had a front page smaller than 500 KB. 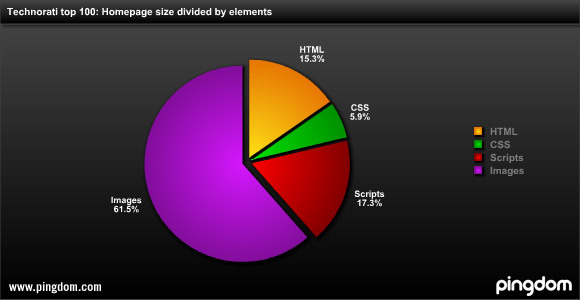 39% (the largest segment) had a front page between 500 KB and 1 MB. When averaging all the 100 blogs included in the survey, it was clear that the single largest contributor to the size of the front page was images, which in itself should not come as a surprise considering that today’s blogs often are very visual and contain many images. 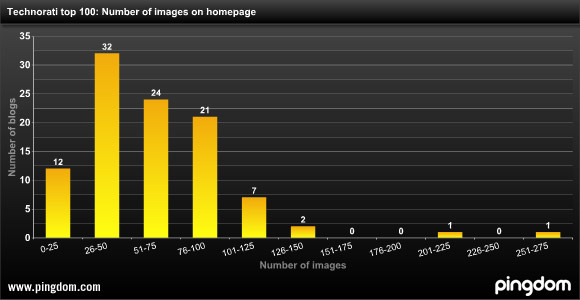 On average, there were 63 images included on the front page, though the number varied greatly. Some had less than 10 images, while others had more than 100. You can see the distribution in the diagram below. In addition to images in the posts themselves, images are also common in the design of the layout of the blog, which can explain the large number found in some blogs. Both images included in the HTML and the CSS are included in this count. On average, there were 9 script files included on the front page, and here too the number was very varied between the different blogs. The page with the most scripts had as many as 35 script files included. As this survey has shown, three out of four blogs have front pages larger than 500 KB, and more than one third have a front page larger than 1 MB. Note, however, that this assumes that the bandwidth is utilized to 100%, which normally won’t happen. The above numbers just show you the theoretical upper limit. In short, blog readers with slower connections will have problems loading the front page of many of today’s blogs, at least with images enabled. Optimize the size of the images. Depending on its content, an image size can be optimized by choosing an appropriate format, compression level, color depth, and other relevant settings. Use fewer images (many blogs have a large number of small image elements). This will also have the positive side effect of fewer requests being made to the web server which is also beneficial for performance. One way of having fewer images is the use of so-called sprites, where several images are stored in one. 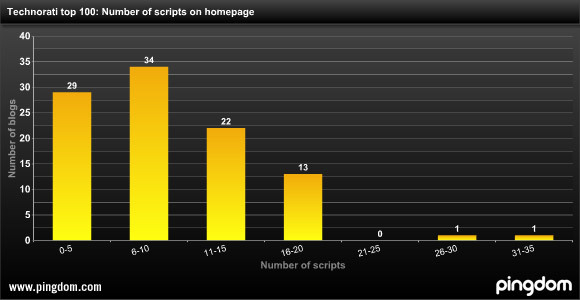 It can be a good idea to see if it is possible to reduce the number of scripts used on a blog. Are all of them really necessary? Are there for example scripts present from WordPress plugins that you are not using anymore? Since reducing the number of requests to the web server is a good way to enhance performance, it is often a good idea to merge all your scripts (or at least most of them) into one file, making it one single download. Another factor to consider is that by including external scripts, a blog’s load time can be affected by loading issues with that external script (which is outside the blog owner’s control). These are just a few advice regarding these specific areas. Website optimization is a huge subject and going into detail here would be outside the scope of this report. There will of course be some size variations depending on the current content presented on the blogs, but the overall, average data is not bound to change much and is highly relevant, especially considering the large sample base. Even broadband users would benefit from smaller page sizes with fewer objects on them. This would speed up the responsiveness of the website for them as well. Ultimately it would also be beneficial for the blog owner since it would put less stress on his server(s) and demand less bandwidth. We suspect that not all blog owners are really aware of how large their blog pages actually get, so we hope that this report will prove helpful in raising discussion around this subject. Some blogs are bound to be large, especially if the content relies heavily on images, but many others could most likely significantly reduce their download size (and download speed) with the few simple measures we mentioned above. The data was collected with the Full Page Test in Pingdom Tools, which is a Web-based tool provided freely by Pingdom. It will load and analyze all elements of a web page and present the data in a way that can be examined and filtered with a simple interface. The tests that provided the basis for this report were performed on October 30, 2008. I have to say I’m a bit surprised. But then again… To get a lot of traffic, the blog has to look good. But at the same time this means you only really cater to the higher bandwidth folks. But more than that, a common technique with blogging is to include at least one picture with each post. Assuming about 10 posts on your main page, that’s at least 10 higher sized pictures. Then you have your theme’s pictures. So I can see it quickly escalating to 1mb. I guess the bigger question is, where can you surf online today where you don’t need broadband speeds? There’s not many sites left that support modem speeds anymore. Great article Pingdom. Those graphs are really awesome. Nice analysis. Are you differentiating between images and flash objects? Over 500k in images in insane, even with broadband, because that is likely to defeat the browser cache after a day or two and then your site bandwidth use goes up and up and up. I’m also planning a redesign to try to declutter the blog while making it look better visually, and I’m hoping I’ll be able to make load times a little quicker while I’m at it. I recently analyzed the same thing about my site. I used a lot of images for my blog’s navigation layouts etc and was running out of bandwidth every month. 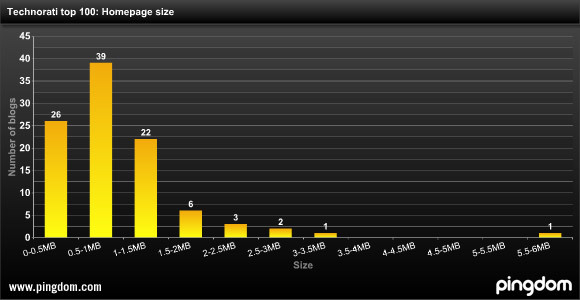 The main page total size stood at around 500 kb. I then switched to a newer layout that minimized the use of images and did its things with css and colors. Result: Main page now stands at < 80k. Bandwidth usage has also been cut into less than 1/4th. _ck_: Yes, flash objects are not seen as images. Images are only png, gif and jpegs linked in the HTML and CSS code. Great article. As has been said, great work on the graphs. There’s really no excuse for weighty sites – but it has to be said that a combination of designers who favour eye-candy over performance and functionality (yes, good looks are important, but only if you have a chance of seeing them – pity people on a poor link) and bloggers who have a bad case of plugin-itis have to stop and think. When we’re building themes for WordPress or clients (I’m trying not to self-promote here, but bear with me) we make a point of testing on devices such as mobile phones, and with a throttled broadband connection. Ultimately it matters a lot of your users can’t read your content. If you service a community of broadband connected geeks it’s probably not so bad, but if you’re trying to reach a broad audience then it’s important to test test test. Yslow is your friend. @Andy: Thanks. Interesting comparison there. Thanks for the heads up! I also care for one images per post as it makes it look good and also do not take long time while loading. Your results are helpful to understand these things.